It's been a while since we've carved a pumpkin, so Jenn and I decided to grab a few pumpkins this weekend. We also picked up a couple pumpkin carving kits complete with tools and stencils. Jenn did an awesome job on the haunted house, while I struggled a bit with the smaller ones and trying to figure out what I'd like to do with the other big pumkin. I think it came out alright, but far from what I had in mind. Not bad at all and I'm sure we'll come off tighter next year. Now this guy, The Pumpkin Gutter, is freakin' tight! BTW, check out my better half's new blogspot, Dumpster for my thoughts. 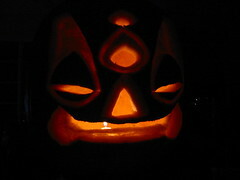 Have a safe Halloween. 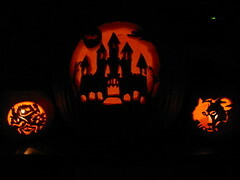 CRAZY COOOOOL Pumpkin carving!! THese are awesome! !